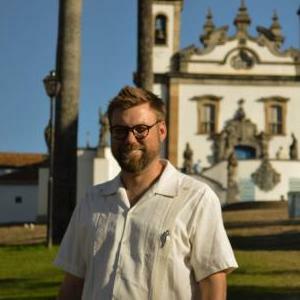 Dylan Clark is an anthropological archaeologist who studies the indigenous cultures and social history of Mexico and Central America. As the new resident archivist, Dylan is inventorying and curating the BEC’s numerous archaeological and ethnographic objects (e.g., textiles, ceramics, photos, transparency slides, documents, etc. ), He received his Ph.D. in Anthropology from Harvard University where his dissertation research focused on the ancient Maya culture, specifically the coastal Maya who built port communities along the Gulf of Mexico and Caribbean Sea from as early as 300 BCE. Prior to coming to Asheville, he was a William Tyler Fellow in Pre-Columbian Studies at Dumbarton Oaks Research Library and Collection in Washington, D.C. (2011-2013) and a Fulbright DDRA Scholar in Mexico (2009-2010). Since 2007, he has been excavating the material remains of houses at the small island port of Isla Cerritos in Yucatán, Mexico to try to figure out how this coastal community was organized socially, what life was like there around 800-1250 CE, and how port communities and maritime societies contribute more broadly to the human endeavor. In addition to Isla Cerritos, Dylan has conducted archaeological excavations in the Maya region at Chichén Itzá, Chunchucmil (say that three times fast! ), Rastrojón, and Copán (Honduras). He’s also carried out fieldwork in historical archaeology in Michigan and New England, and is likewise passionate about linking the past to the present through museum studies, public archaeology, and heritage studies.